I think it is essential for players and am always looking for ways to make it more productive, challenging, and game like. I found these four versions of one on one on Zak Boisvert’s site pickandpop.net. Zak is an assistant men’s coach at Maine. These are 4 of his favorite one on one drills. Whenever you are playing one on one, always keep in mind that you are working to develop one on one skills to utilize within your team’s offense and for the benefit of your team. It is always best to work with a coach when you can, but if you don’t have a coach, you can ask a teammate, friend, or family member to do the passing parts of the drill for you. 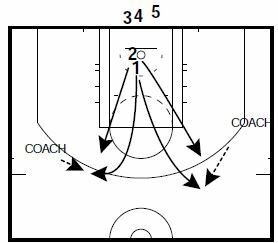 Coach on each wing with a basketball. Offensive player (1) can loop to catch at either slot. 2 trails him out and defends him on his catch. 1 has three dribbles, but has the ability to pass it back to either coach at any time. 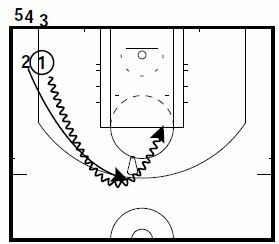 Winner of possession (offense scores, gets an O rebound or is fouled; defense gets a stop), throws ball back to coach and sprints to one of the two spots as the next player up on the baseline sprints on to defend him. 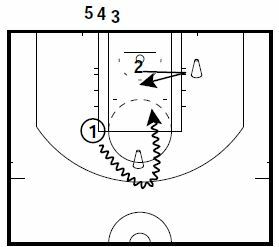 On coach’s call, 1 and 2 sprint around the cone to play 1-on-1. On coach’s call, 1 rounds the cone and attacks the rim and 2 slides/sprints t o touch his cone. Winner of possession goes to O. Loser goes to back of line, new player steps on for D.
We appreciate your time. 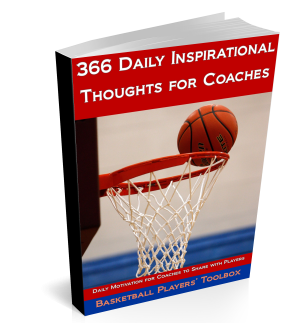 Enjoy the 366 Daily Inspirational Thoughts for Coaches E-Book for FREE.